The seasonal four-course menu is designed for early evening nibbles from 6 to 7:30 pm, and includes the option to select premium dishes recommended specially by Chef Andy Toh. We opted to sit in the smoking section, which was empty when we arrived around 6:20 pm: an adequate setting with chill music for our heads and minds to calm down. After trying to understand the waiter’s explanations regarding the tasting menu, we ordered a mojito with a twist and a gin-based prosecco and raspberry cocktail. Both were quite refreshing, with a good balance in ingredients. The 6 main course options are all served with steamed jasmine rice (which could be a bit more perfumed), with the “Osmanthus wagyu beef rib eye” being charged at an additional AED60. 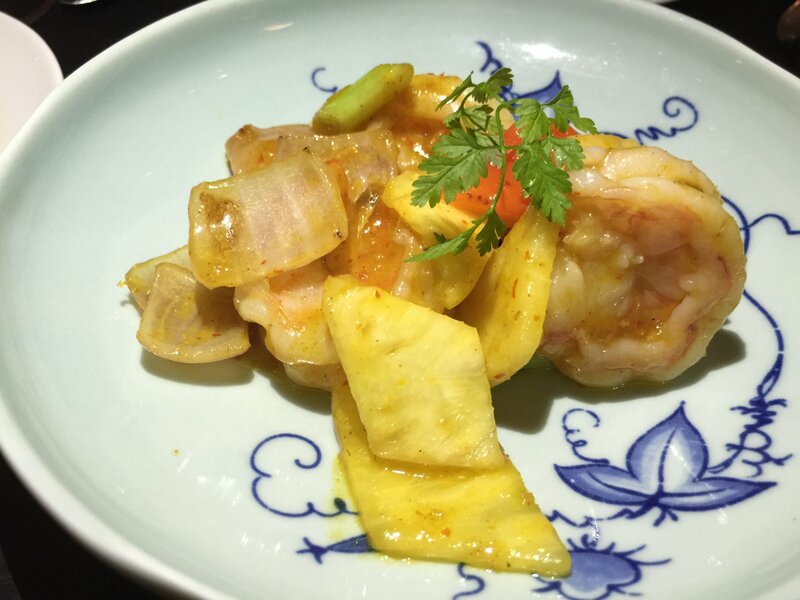 Our “stir-fry tiger prawns with pineapple” in a spicy dried shrimp sauce and “steamed red snapper with ginger sauce” were nice, but less impressive than the starters. For our taste, both dishes might be enhanced with a bit more flavour. generous, filling us up before dessert. However, we couldn’t resist trying what seemed to be a very fresh option and another intriguing one. The “hazelnut Jivara bomb” with chocolate sauce was a delightful surprise in every sense of the word: rice crispy bits throwing little sparkles in the throat and mouth coated a hefty ice cream scoop, all drizzled in chocolate. It reminded us of the sparkly lollipops from our childhood but in a fancy, upscale kind of way. The “homemade sorbet” flavours: pina colada, raspberry mint and black orange tasted as good and invigorating as they sounded creative. The cigar service at Hakkasan is top notch! A soon as a cigar emerged from my colleague’s cigar holder, a cigar ashtray, matches and cedar wood sticks appeared on the table, ensuring an enjoyable smoking experience. At AED188 per person including a seasonal cocktail or mocktail to refresh the palate, the Taste Of Hakkasan offers a reasonably-priced fine food tasting menu within the oak-latticed venue in Emirates Towers. “Taste” it before the restaurant closes temporarily during Ramadan.